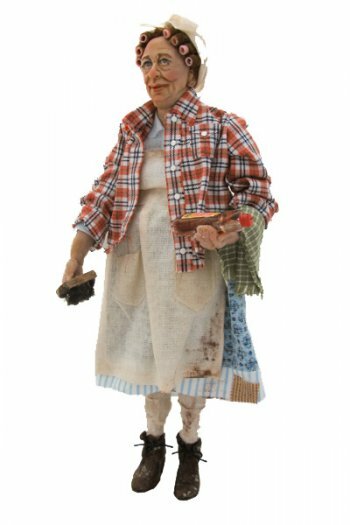 This is Doris Dee, the Cleaning Lady by The Colvin Studio. She is a 1/12 Scale character and has a great face and a big personality. She is 5 1/2" to 6" tall and is hand sculpted from Polymer Clay. She is a wonderful 1/12 Scale Character with a lot of personality. She is cast by the artist in durable high quality resin and is highly detailed as are her clothes.A great character for your miniature setting. She has all the necessary cleaners and a pail and will be glad to clean your whole dollhouse.